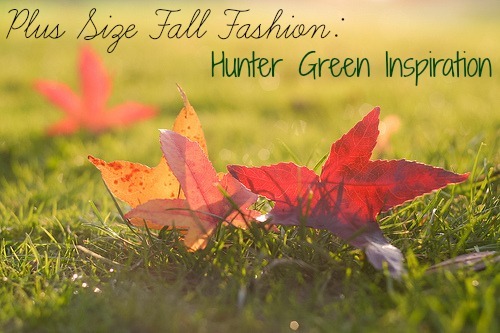 Aside from sweaters, there are a few specific colors that just scream fall to me, like hunter green, one of fall 2013’s hottest color trends. 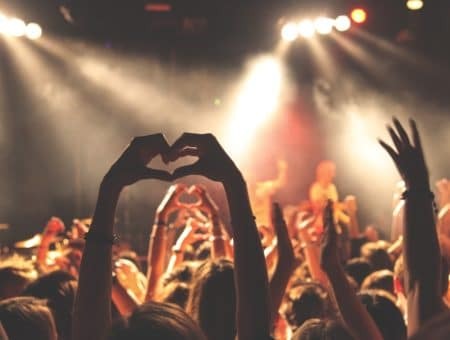 Want to rock this look? 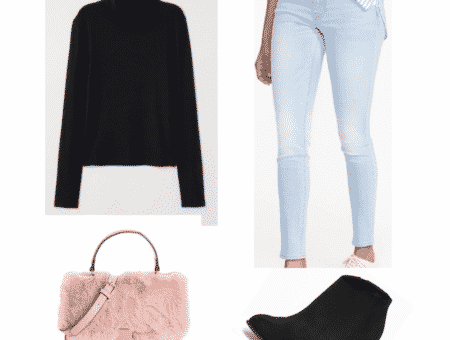 Scroll down to see some plus size-friendly outfits featuring this popular fall hue. 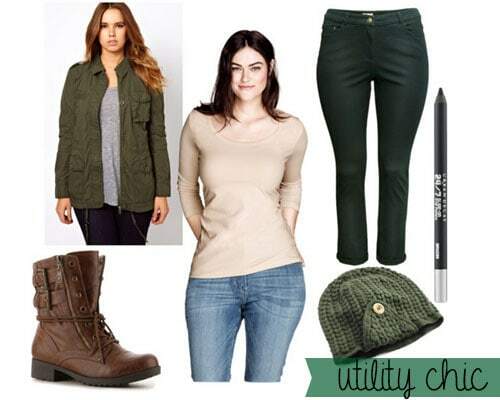 Utility jackets are the easiest way to incorporate the color green into your fall wardrobe. Useful and stylish, they provide not only warmth in the chillier weather but complete the entire outfit. Layered on top of a plain beige three-quarter-sleeve shirt and green skinny pants, the entire look is dominated by the dark green hues. You’ll surely stand out in a sea of oranges and yellows as the leaves begin to change! To complete the ensemble, throw on some boots and a beanie. If you’re as big a fan of eyeliner as I am, try Urban Decay’s 24/7 Glide-On Eye Pencil in Invasion (described as deep dark green matte color on Sephora‘s website) on your upper eyelid and you’ll be in love! This white lace and green sleeved shirt combined with khaki pants can stand alone as a cute fall look, but if it’s windy outside, grab a jacket or even a beige cardigan. Since oxford shoes are great to wear in the summer as well, it’s easy to transition into fall by keeping them a steady staple in your closet. Add the green and khaki backpack – perfect for class – and you’re all set! 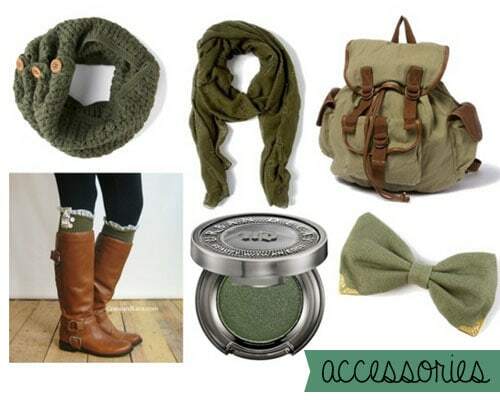 It’s no secret that accessories complete an outfit and finding them in hunter green has never been easier! Walk into any store and you’re sure to find countless accessories and some of my favorites are pictured above. Scarves, of course, are vital in the colder months. The first knit scarf has beige buttons that add an ultra-girly touch, while the second one has studded crosses printed all over the fabric for an edgier look. The brown and green backpack is both stylish and useful when heading to class. As winter approaches and the weather gets colder, you’re probably going to be wearing a lot more boots, and what better way to add some flair to them than with lace trimmed cable-knit socks from Etsy? You can never go wrong with Urban Decay – this eyeshadow, Bender, is perfect for blending on your lids! And, of course, hair bows are a simple and girly way to pin back your hair and add some pizzazz. Which is your favorite look? Would you wear either of them? What are some of your favorite hunter green accessories? What are your favorite colors for Fall? Let me know in the comments!